On Friday, the US nonfarm payroll showed the labor market expanded by 321k jobs in November, significantly above analysts’ predictions of 230k. The unemployment rate stayed the same at 5.8pc. 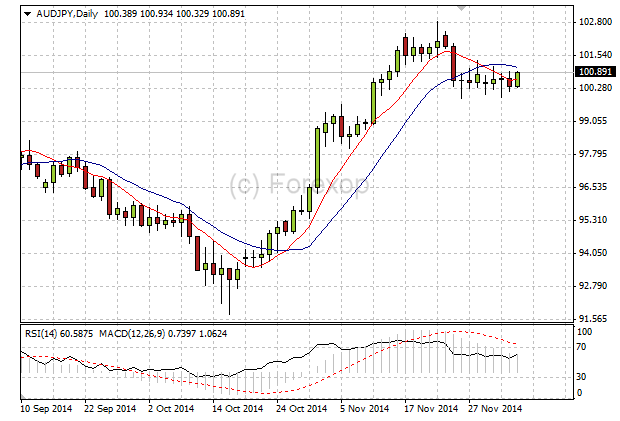 USD/JPY traded up to 121.24 on the news. The pair has been in a sharp uptrend since July, gaining nearly 20pc over that period. Remarkable strength in the US economy and labor market has increased the chances of interest rate rises in the U.S next year. Next Thursday we will see the US retail sales report, and this will give insight into the all-important November consumer spending data. The flip side of this rally is of course a weaker Yen. A weak Yen is beneficial to the Japanese export led economy, and we have seen this encouraged by the BoJs recent stimulus measures. But the weakness is also making imports more expensive so we expect the BoJ to talk-up the currency in the coming weeks, especially with an election ahead. Look for pullback in USD/JPY if this happens. The rally in the Euro was short lived last week as Mario Draghi announced that the ECB will delay the purchase of sovereign debt and the expansion of its stimulus package. On Friday, after the strong US jobs report, EUR/USD fell to two-year low of 1.2271. The European Central Bank now proposes to reassess the economic data early in 2015. EUR/USD briefly spiked 120 pips on the news, trading at 1.2450, before falling back again. The statement also saw European stock markets fall. Many traders were anticipating an increase in QE to boost the ailing Euro zone economies. That didn’t happen. Markets prefer clear communication, and decisive policy. Yet traders continue to receive confusing and mixed messages from ECB, not to mention, opposing views from the European leaders. Germany is against an expansion to quantitative easing that would see the ECB purchasing sovereign debt and expanding its balance sheet. This measure would have an immediate impact on real interest rates, making government borrowing cheaper. In effect, Germany would again be underwriting failing Euro zone economies. QE is only a sticking plaster. It does not tackle the fundamental problems in the Euro zone. Germany, favors long-term structural reform within each member country. France and Italy, where tax and employment law is inhibiting growth, are in dire need of reform. But structural changes could be extremely painful readjustments for the countries involved and politically unachievable. Meanwhile, lower oil prices are causing downward pressure on inflation in the Euro zone. Lower inflation will also add stimulus to the economy, particularly boosting consumer spending. The ECB is again choosing no action over action, instead playing a waiting game to see what happens. Weakness in the Euro zone continues to be the immediate threat to Sterling. The Chancellor’s statement was broadly positive for the UK currency with GBP/USD recovering some of its losses from earlier in the week, rallying to 1.5716. The reform in stamp duty will add some stimulus to the UK housing market, which has slowed in recent months. It will also have a knock-on effect in other areas of the economy such as house builders. Risks are on the horizon for Sterling however, particularly with the general election in May 2015. The main opposition party, Labour, has a track-record of poor fiscal discipline. There is still substantial public debt, and the annual borrowing requirement (deficit) still running at 5pc of GDP. Paying this down relies on low government borrowing rates. The low rates enjoyed now are a result of fiscal stability and a decent economic outlook. If a new government undermines this, either through failing to control public finances or through policies that are hostile towards business, the outlook for the UK could be extremely bleak. We would expect Sterling valuation to adjust sharply downwards accordingly. This uncertainly will weigh on the currency in the current months and with the election being very close-to-call we will likely see increasing volatility too. We have a cautious outlook on the Aussie dollar for several reasons. The GDP report out Wednesday showed that growth had declined in the third quarter. It was still a relatively healthy 2.7pc annually. The RBA kept interest rates at 2.5pc in last week’s meeting as most analysts expected. Ominously though, they remarked on the currency valuation, which is seen by the committee as “of concern”. Falls in commodity prices are hurting Australian exports, which impacts several areas of the economy. The RBA may want to rebalance this with a lower exchange rate. A rate cut would achieve this. AUD/JPY has seen significant gains over the last two months. We now see the pair as being highly vulnerable to event risks. Any financial shock could see an unwinding of these positions.